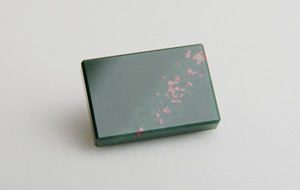 Dark green chalcedony with small red blood-like spots. Also called heliotrope. 2 specimens: 0743 — 2.45 ct, Madagascar; 0745 — 2.04 ct, Madagascar.